Basaksehir completed the transfer of Demba Ba from Chinese side Shanghai Shenhua. The experienced striker has previously played for Besiktas and Goztepe in the Super Lig as well as Chelsea and Newcastle United in the Premier League. 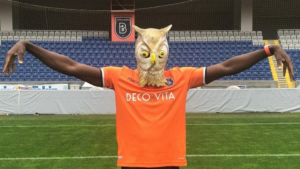 The Istanbul based side unveiled the transfer with Ba wearing an owl mask and a video involving the Godfather, a Turkish singer and a clip from a Turkish soap drama. The owl is the emblem of Basaksehir. The club’s first fan group was called the ‘Boz Baykuslar’ (Grey Owls). It was a word play on Bozkurt (Grey Wolf) which plays an important role in Turkish/Turkic mythology. The owl represented the fact that the fan group were a small band of university students – owls beings synonymous with the wise. As for the video well the last four letters of Demba Ba are ‘Baba’ which is Turkish slang for ‘Godfather’, hence the Godfather angle. The singer was Muslum Gurses who is known as ‘Muslum Baba’ and the clip from the television show Cocuklar Duymasin involves the protagonist from saying ‘Baba, baba, baba’ – his catchphrase.